On the left bank of the Rhine, not far from Düsseldorf, Krefeld is a conurbation of towns incorporated into a city at the start of the 20th century. At that time Krefeld was a booming textiles town with a forte for silk and velvet weaving. Even now, Krefeld is called the “Samt- und Seidenstadt,” velvet and silk city, and there are still a few places recording this heritage. One is the German Textiles Museum, which draws on one of the world’s richest collections of fabrics. The affluence generated by textile manufacturing is also unmistakeable in some of the properties in the city: The most remarkable are Haus Lange and Haus Esters, designed by Bauhaus member Ludwig Mies van der Rohe and now a department of the city’s art museum. 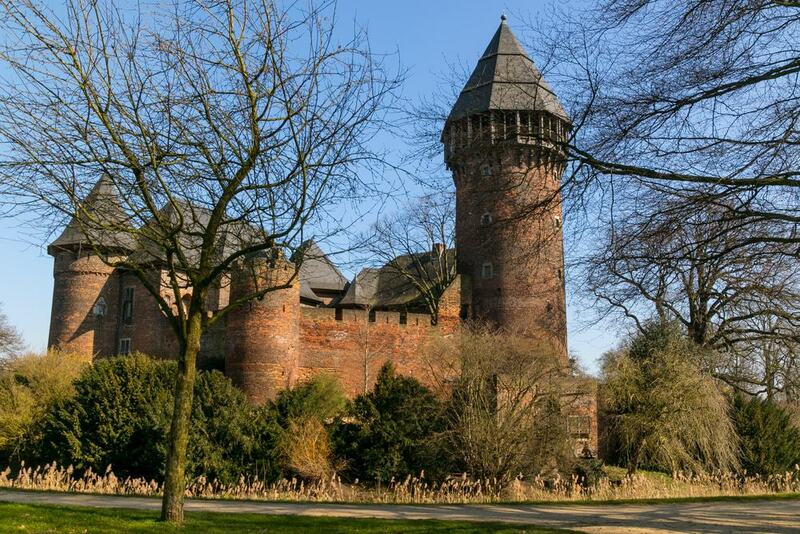 In the eastern suburb of Linn is the oldest castle on the Lower Rhine. Burg Linn was raised by the local landowner Otto von Linn in the 1100s and by the 1400s was one of the largest moated castles in the region. But during the War of the Spanish Succession it was razed to the ground, and stayed without a roof for the next 250 years before a thorough restoration after the Second World War. The building has returned to its Late Gothic appearance and you can contemplate the landscape from the top of the keep. There’s also a 14th-century chapel in the castle, lit by lancet windows and with Gothic vaults. The grounds deserve some time, to visit the castle outbuildings, vestiges of the 17th-century bastions, the moat and mature trees sprinkled here and there. In the 18th-century hunting lodge neighbouring the castle there’s a museum for the Lower Rhine region. The lodge was for the Archbishop-Elector of Cologne, Clemens August of Bavaria. The 18th and 19th-century interiors and furniture have been preserved, and there’s a cache of historical mechanical musical instruments like musical clocks, music boxes and player pianos, which on Sundays are all switched on. But it’s the archaeological museum, featuring discoveries made on this site and around the Lower Rhine, that might be most exciting. There are finds like pottery, glassware, jewellery and ceremonial armour from the 6,000 Roman tombs unearthed in nearby Gellep. 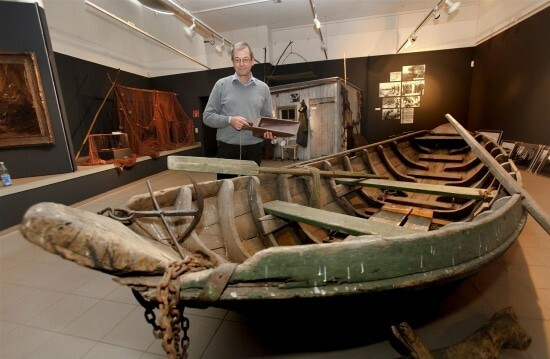 Be sure to see the Carolingian barge and the skeleton of Otto von Linn, the man who founded Burg Linn 900 years ago. The main building for the Kunstmuseen Krefeld is in an Eclectic-style palace inaugurated in 1899. The museum’s reserve is enormous, consisting of 14,000 works from the fields of painting, sculpture, graphical art, applied art, photography and new media . The strong point though is 20th-century art, beginning with sculpture by Rodin, one of Monet’s studies of the Houses of the Parliament and paintings by Expressionists like Emil Nolde, Heinrich Campendonk, Kandinsky and Kirchner. Moving through the 1920s you’ll come across Constructivists like Piet Mondrian, Jan Thorn Prikker and László Moholy-Nagy. And just some of the many illustrious names from the post-1945 galleries are Joseph Beuys, Heinz Mack, Yves Klein, Jean Tinguely, Gerhard Richter and Sigmar Polke. Some noteworthy shows at the Kaiser Wilhelm Museum have featured the work of Giacometti and Alexander Calder. This pair of villas was designed by Ludwig Mies van der Rohe for two Krefeld textile industrialists. Dating to 1928, they are in the Bauhaus style and are sets of reinforced concrete blocks clad with bricks. The use of concrete allowed for massive window openings that drench the interiors with light. Haus Lange and Haus Esters come under the “Kunstmuseen Krefeld” umbrella and are both museum pieces in their own right. The strict formalism extends to the gardens, also designed by Mies van der Rohe, that have straight paths and beech hedges cut at right angles. The German Textile Museum has an internationally recognised fund of textiles, clothing and woven fabrics from all time periods and parts of the world. There are around 30,000 pieces, and since none of these can be kept on show for extended periods the museum stages only temporary exhibitions. The museum closes when there’s no exhibition, so check what’s on in advance. The collection started in the 19th century as an archive for Krefeld’s textile companies to help train machine operators and designers. But before long it had take on the Prussian Royal Fabric Collection, private donations and liturgical vestments damaged in the war. To help preserve the fabrics the temperature inside is kept at 18°C and at the time of writing the exhibition was about the history of German high fashion. If you need a breather or somewhere for a morning jog, Uerdingen’s city park is somewhere to keep on the radar. The park was landscaped in the 1900s, and the previously marshy ground next to the Rhine was drained into a pond. Rounding off a very romantic scene on the south side of the pond is the park’s restaurant, set in a listed Neoclassical building from 1911. As with most parks, many of the attractions are seasonal. So if you’re around at the end of winter the meadow by the entrance is dappled with 10,000 daffodils. Blooming in July, the daylily garden has more than 100 species, arranged according to age and region. 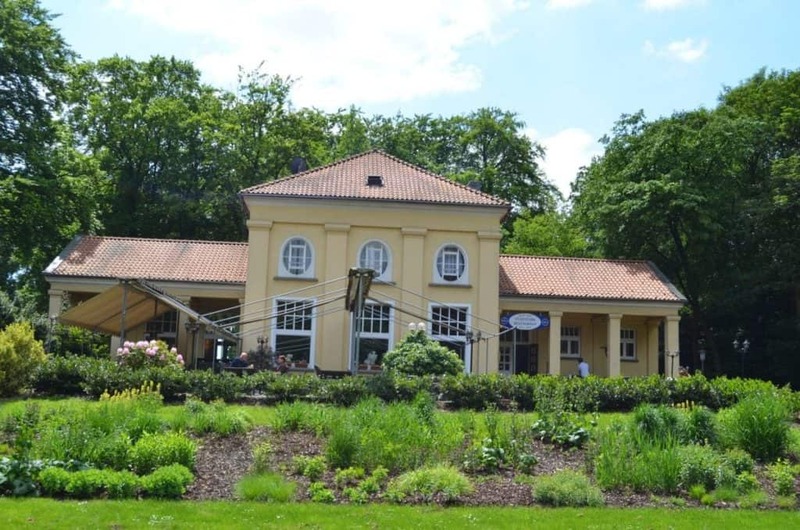 There’s even more horticulture at Krefeld’s botanical garden in the Oppum district. The first specimens were planted in 1928 and there are now 5,000 species in a 3.6-hectare plot. As well as native flora, there are rare cactuses, carnivorous plants, a vegetable garden and a rose garden that has 3,000 bushes. The cactuses are in the greenhouse, which opens from May to October. Also fascinating is the apothecary garden that has 100 herbs that are used in teas and modern or historic medicine, along with signs about their chemical makeup and their effects on the body. Planted here is also a selection of labelled poisonous plants. On Luisenstraße 15 is a museum with a privileged insight into Krefeld’s silk and velvet industries. This house contained a workshop where for more than 100 years liturgical vestments were woven from Chinese and Italian silk yarns. There are eight hand-operated Jacquard looms here dating to the 1800s, documenting a craft that is no longer practiced today. The delicately woven vestments produced by the workshop are also exhibited at this handsome Historicist house dating to 1868. On the street you’ll see that the house has two entrances side by side: One for customers and the other for employees. 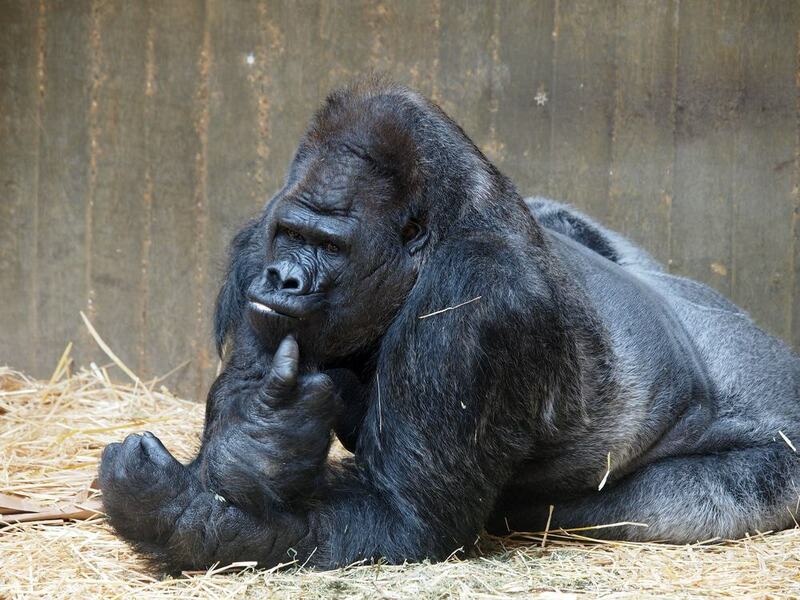 Krefeld’s most visited attraction is its zoo, which opened in 1938 and today welcomes more than half a million people a year. Many of the living spaces are set indoors, simulating the animals’ natural environments more closely. This applies to the Affentropenhaus, housing orangutans and chimpanzees, and with exotic bird species living in the trees. The Schmetterlingsdschungel butterfly house is unique to the Lower Rhine, where 200 butterfly species flutter in tropical vegetation. Also indoors is the Regenwaldhaus, which has wooden walkways through jungle in which iguanas, birds and monkeys like white-faces sakis go where they please. Outside is a large savannah zone for African ostriches, antelopes and rhinos, as well as enclosure for tigers, snow leopards and jaguars. The origins of Krefeld’s city forest go back a century to the silk manufacturer Wilhelm Deuß who donated land to the city and set up a foundation for a much-needed recreation space for Krefeld’s workers. If you come in the summer there’s a great deal to get up to in this 120-hectare park. The Stadtpark has a large, sinuous pond, fringed by a walking path, and station for renting pedal boats. The park has ample sports facilities, from tennis and squash courts to full-sized football pitches. But the big sight is the Stadtwaldhaus, a lovely Art Nouveau building, which to its rear has one of the largest beer gardens outside Bavaria, for more than 3,000 guests. 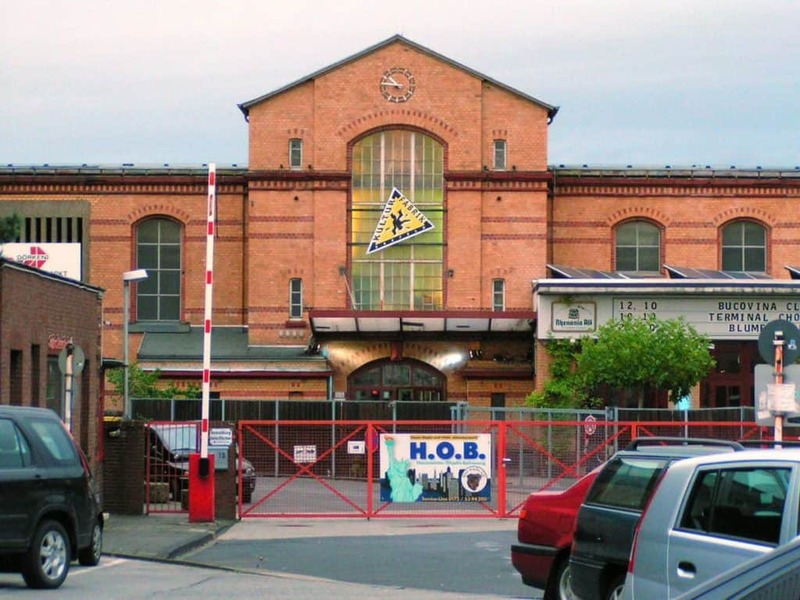 If you need an idea for an evening out, Krefeld’s Kulturfabrik is a performing arts venue in a converted factory. Theatre groups, comedians, cabaret artists, solo artists and bands are all on the schedule at two halls, one for 350 spectators and a larger one that can fit 1,000. Kulturfabrik also organises club nights for anything from 90s nostalgia to dance music, rock and industrial music. And for seasonal fun there are one-off parties around Christmas, Halloween and Oktoberfest. In the northwest of Krefeld the landscape becomes very sparsely populated, and after the war this spot was chosen to dump the rubble from Krefeld’s bombed-out buildings. That rubble was heaped to form Kapuzinerberg and Inrather Berg, which are strange, sudden bumps in the landscape, 77 and 87 metres high respectively. Hülser Berg, the tallest natural hill is also here and has a 30-metre lookout tower, the Johannesturm at its crest. From the top you’ll have an interrupted panorama of the Rhine Valley and west to the Ruhr. Also in the park are enclosures for goats, fallow deer and red deer, as well as a playground for kids and an educational trail about the local wildlife. In Uerdingen by the Rhine there’s a brandy distillery anchored in Napoleon’s occupation of the left bank of the Rhine at the start of the 19th century. 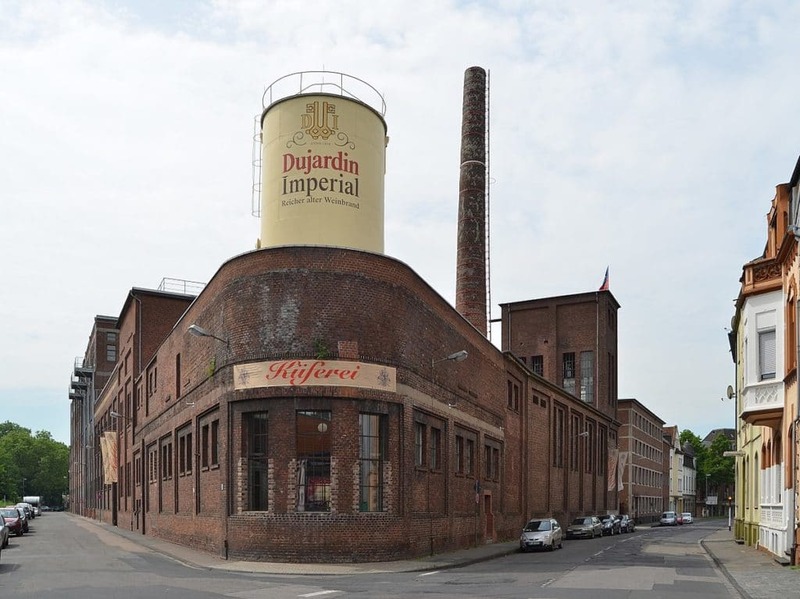 Later, after the Franco-Prussian War the distillery owners, the Melchers, started sourcing their ingredients from the Dujardin family in Cognac, creating a cross-border enterprise. Production has now been moved away from this distillery, but the vintage copper stills, barrels that can hold 9,000 litres and a collection of 100-year-old bottles remains. On weekends you can take a guided tour of the beautiful brick industrial buildings, and the price includes a glass of their brandy. At Friedrich-Ebert-Straße 42, Villa Merländer is the home of the Krefeld silk merchant Richard Merländer, who was born in Mülheim just across the Rhine in 1874. He was both homosexual and Jewish and so was persecuted by the Nazis, being forced to sell his business and property for less than they were worth in the 1930s. Then in the war he was sent to Treblinka where he was murdered in 1942. 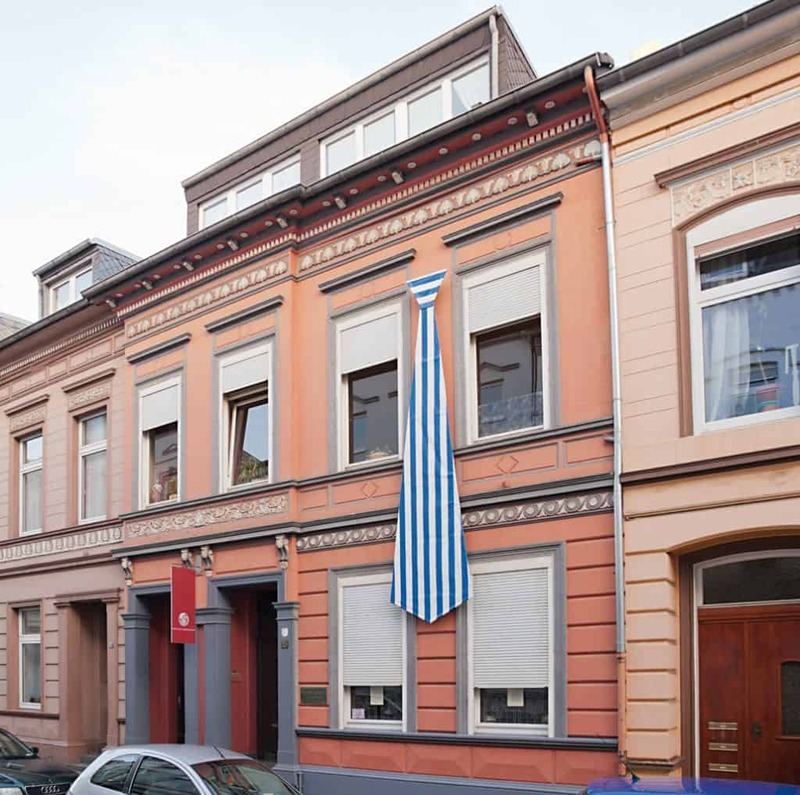 The house was used as a hotel up to 1989 before being bought by the city and restored to its original appearance to serve as a memorial for Krefeld’s holocaust victims. There are plaques for Richard and his brother Karl outside, while the interior has the only known murals by the Expressionist artist Heinrich Campendonk. 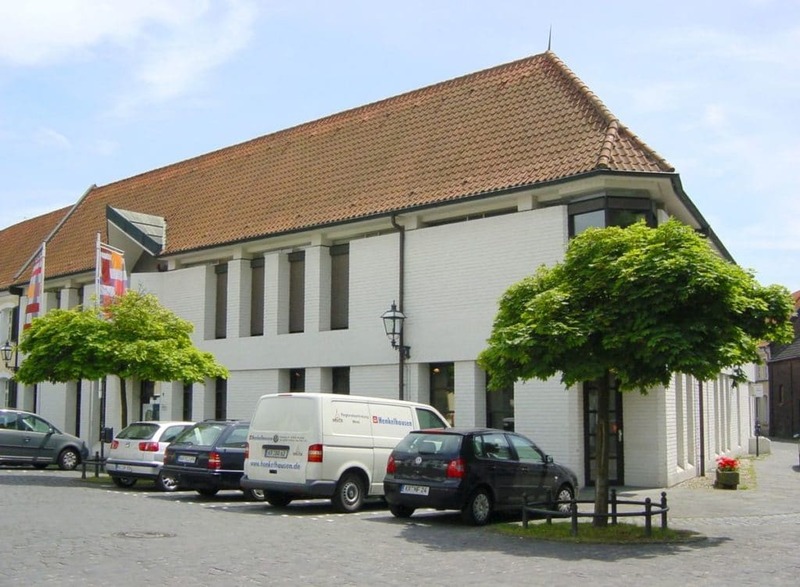 The building is now home to Krefeld’s culture department. In North Rhine-Westphalia the conurbation is compact enough that within half an hour you could be in any number of other exciting places. 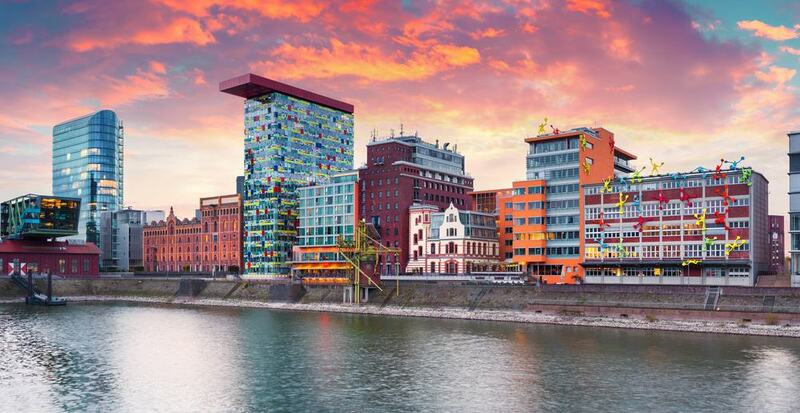 Krefeld is on the Düsseldorf Stadtbahn, so even if you don’t have a car you could catch the U76 and go window shopping on the posh Königsallee or order a glass of the local Altbier at a bar in the world-famous Altstadt. If Krefeld’s industrial heritage has captured your imagination then Duisburg is only 25 minutes via commuter train. The world’s largest inland port merits a boat tour, while the revitalised Inner Harbour has massive granaries converted into art galleries and museums.